Fight or Flight: Does Your Brain Know What to Do? In an emergency-type event, the stress alarm is sounded in your brain. 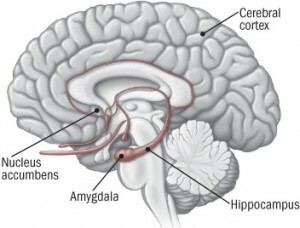 Any perceived danger sends a message to the amygdala which controls emotional processing. Then a distress signal is sent to the hypothalamus which is basically your body’s command center. This area of the brain communicates with the rest of your body via the nervous system controlling breathing, blood pressure, heartbeat, etc. This is why you might find yourself with an elevated heart rate, accelerated breathing, or a heightened alertness when facing an emergency. The question is what do you (or what does your brain) do with this burst of energy, especially during a health scare? When faced with a medical emergency, your brain tends to go into fight mode. At this stage it has two choices: panic or respond. The perceived danger is not something you can physically run from but you can emotionally panic. If you panic, the situation can quickly turn to chaos. Conversely, if you respond, you remain in control as best you can. Isn’t it better to stay in control as much as possible? With that said, there are three things to keep in mind when choosing necessary steps in responding. First of all, it’s very important to recognize when an illness or pain is beyond handling at home with either over-the-counter medicine or prescribed medication. When pain or illness is severe and/or lasts longer than a 48 hour time period, it is best to call your physician. Your doctor can evaluate the situation and make recommendations on how to handle it. Of course, if it is a true medical emergency, call 911 immediately! Second, listen to and trust your doctor. He/she is professionally trained. You, your family and friends, or anyone else who might offer their ‘opinion’ based on their own experience, are not professionally trained (unless, of course, they too are a doctor). Also be honest with your doctor. It’s only normal to want to minimize the situation, possibly embarrassed to make an issue out of what you may think is really nothing. However that nothing may really be something so speak up! Finally, try to remain calm and polite. When speaking to doctors, emergency responders such as police and paramedics, nurses, and even any administrative staff, remember you get more with honey than vinegar. They understand you’re worried, stressed and concerned. And you have to understand that they are doing their best to do their job – which is to help you. Have a copy of your medical power of attorney scanned into your patient electronic medical records. Once it’s there, it is always there. If you found this article helpful, please leave a comment below. My next book (currently being written) is based on how not to panic when faced with adversity and I’d like to know your thoughts on that subject. Be sure to check out my most recent article, 5 Anti-Aging Tips to Grow Old Healthfully, published in Make it Better magazine in July 2014. Next month, I’m also quoted in one of their articles. Stay tuned for details.